Laptop buyers looking for an ultraportable Windows 10 device will soon be able to try out a new offering from Samsung that packs a big screen into a smaller package. The company added two new laptops to its Notebook 9 line of portable computers at its press conference on Tuesday, sporting slim Magnesium chassis and USB Type-C ports. These devices aren’t going to boil the ocean, but they’re super-light and easy to carry around, and would appear to be good competitors against Apple’s popular MacBook Air computers. 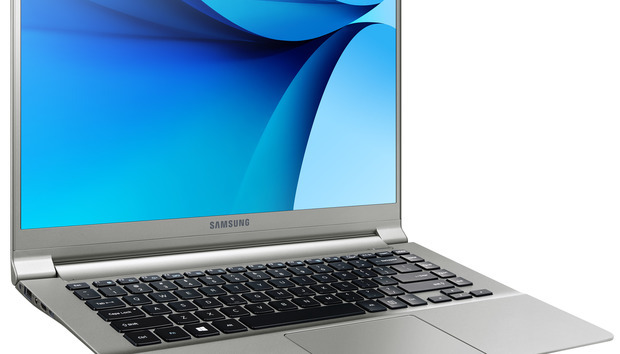 There’s one show-stopper in the announcement of these otherwise standard laptops: the 15-inch Notebook 9 has a slim bezel that allows Samsung to fit a massive screen inside what would typically be a chassis for a 14-inch display. That’s good news for people who want more screen real estate, but don’t want to tote around a heavy or bulky laptop. Beyond that, the computers are fairly normal: they’ll be available for purchase in “early 2016” with 4GB or 8GB of RAM and a 128GB or 256GB SSD. These devices are good news for Microsoft, which is pushing consumers and business users alike to upgrade to Windows 10. New devices like the new Notebook 9s or Samsung’s just-announced Galaxy TabPro S Windows 10 tablet can bring more users onto Microsoft’s latest OS with the promise of better features.